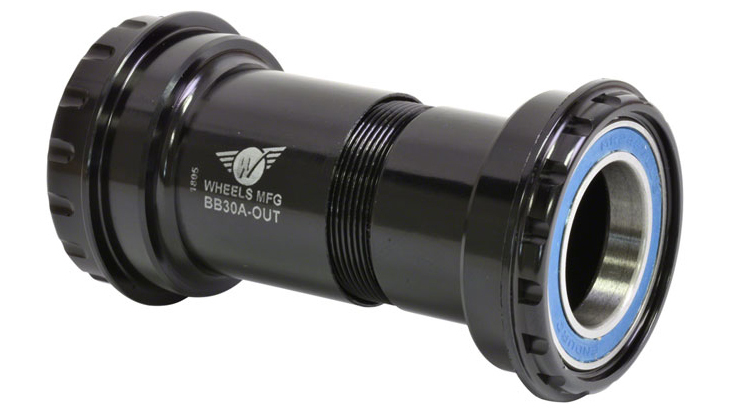 Cannondale's BB30a bottom bracket system uses a 73mm wide shell and a proprietary 30mm diameter crank spindle. The frame's bottom bracket shell itself is not threaded, instead the bearings press directly into the frame. BB30a frame shell inner diameter is 42mm, has two bearing retaining clips and two 6806 sealed bearings pressed directly in the shell. The BB30a is similar to the BB30 standard, but the frame BB shell is 5mm wider on the non-drive side. BB30a system uses thin spacers and/or a wave washer between the bearings and the crank arms to take up any slack and micro-adjust the chainline of the crank. This bottom bracket is designed to accept Shimano HollowTech II cranksets. These cranksets have a 24mm inner spindle diameter.